EXETER – Exeter got off to a lightning fast start on Friday against the McLane Highlanders. Within the second minute Karina Mendez put her first shot into the back of the net for the 1-0 Monarch lead. Then seven minutes later lightning actually struck nearby prompting a 30-minute lightning delay. Thankfully the Monarchs didn’t lose their focus. After getting back on the field Exeter continued to play as if nothing had happened. Exeter coach Darin Lasky said they had been talking a lot about the weather and it is best if his team just focuses on soccer. “It’s tough, yeah. We talked all week about controlling the controllables. You can’t control the weather, you can’t control the game being delayed. 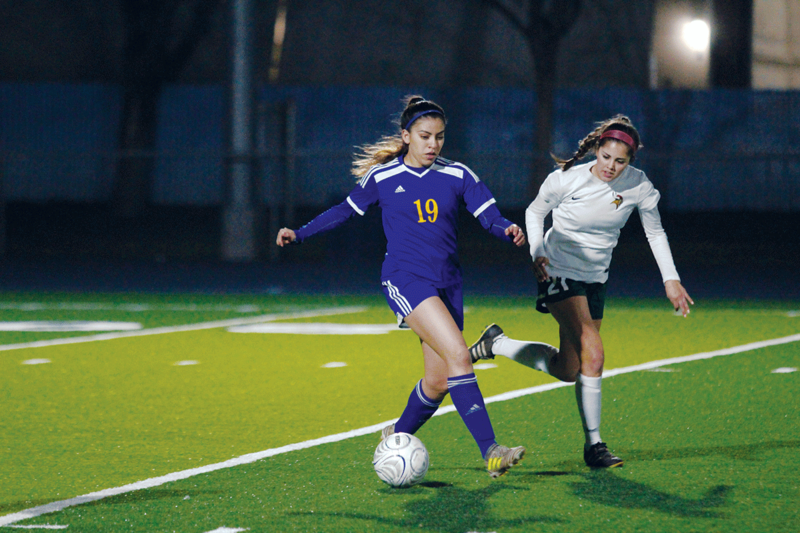 We’re only worried about soccer let me worry about the schedule,” Lasky said. Throughout the rest of the first half Exeter maintained their one goal lead while keeping McLane off the board. While going into the half up by a goal is nice, it was not as if the Monarchs didn’t have their opportunities to extend the lead. “We had multiple opportunities and we just didn’t put it together,” Lasky said. By the second half Exeter got the ball rolling. In the 52nd minute Isabel Martinez put the ball up and over the goalie on a free kick. Just eight minutes later, the Monarchs strung a series of passes together near the goal to open Lexe Cortez at the center of the net for the easy score. After taking some key starters out of the game, up 3-0, the Highlanders finally put their first goal on the board. But they truly gave it right back. Buried deep in their own goal a McLane defender accidentally put the ball in her own net to give Exeter a 4-1 lead in the 75th minute. Putting the finishing touches on the win in stoppage time, Exeter’s Miranda Torres capped off the scoring with a long bending kick that angled over the goalkeeper’s hands and into the corner of the goal. With all the scoring though, Lasky did not forget to mention the effort of senior Kaytee Davidson, who had been sidelined all season until now. Playing as inside defender, she was a veteran presence on a young team. Exeter traveled north up to Fowler to take on the Redcats last night, Tuesday, Feb. 19. The conclusion of which happened after press time.